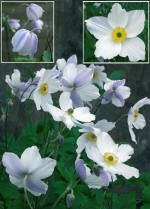 Anemone hybrid Macane001 pp#23132 Wild Swan ™, copf Pride of Place Plants Inc.
” The award has been given to a marvelous performing new perennial plant. 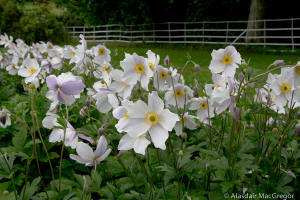 Not only does it exhibit a long flowering habit but is also an exciting flower “. 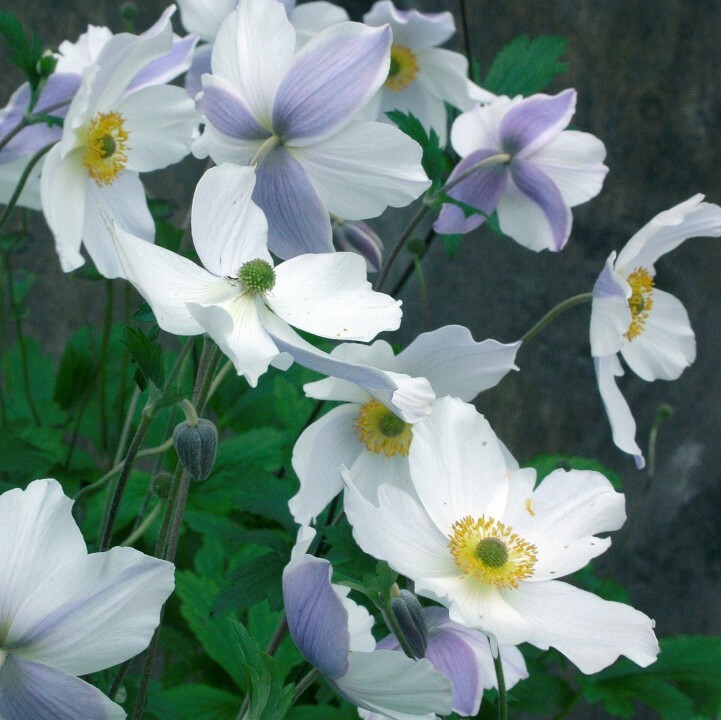 Note: This Anemone hybrid is very unique among herbaceous perennials with a female parent plant of rupicola, making it a larger and more vigorous plant, continuous prolific flowering from mid June until mid November, much longer than Japanese anemone hybrids.one. Plants: This Anemone hybrid is very unique among herbaceous perennials with a female parent plant of rupicola, making it a larger and more vigorous plant, continuous prolific flowering from mid June until mid November, much longer than Japanese anemone hybrids. 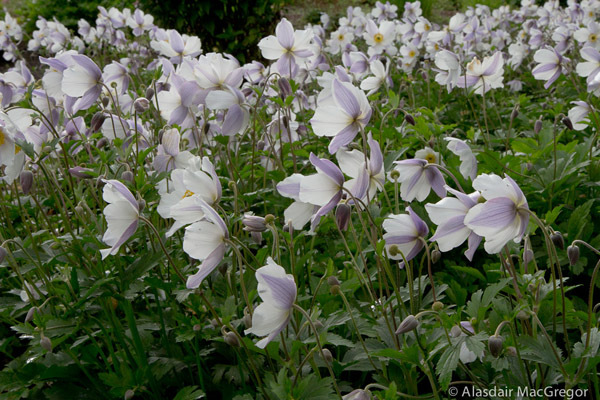 Large pure white faced flowers, a circle of crisp chartreuse yellow stamens, with rich bluish-violet banding on the reverse of the sepals. 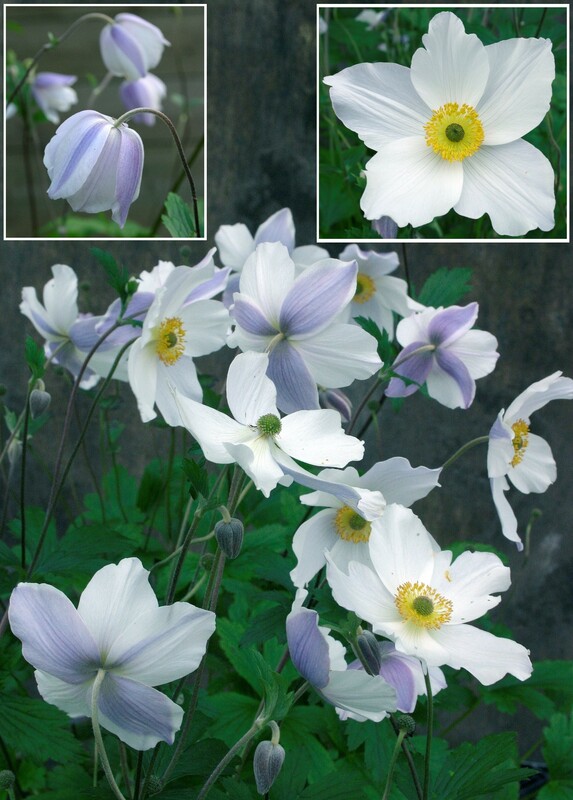 The flowers are held well above the foliage, having a nodding habit in the early morning and evening, showing off the attractive blue characteristic. Care: grow in sandy-loam soil with good drainage, normal rainfall. The occasional removal of spent flower stems will keep it tidy. 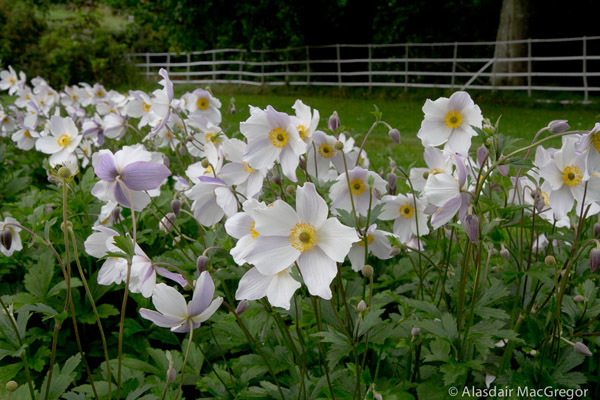 Through a 6 week drought in Scotland without watering, this anemone continued flowering and recovered quickly to normal levels with rain.